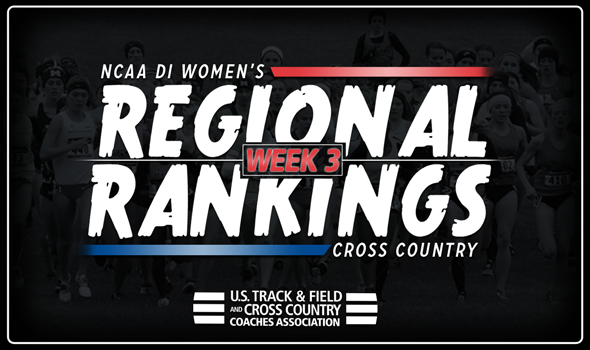 NEW ORLEANS – A quiet week in the sport meant a quiet week in the latest installment of the U.S. Track & Field and Cross Country Coaches Association (USTFCCCA) NCAA Division I Women’s Regional Cross Country Rankings. With just a few major meets on the slate from this past weekend, there was not a tremendous amount of movement in the rankings. Out of the nine regions, only four saw a shake-up within the top-five, and just one program crept to the top of their respective region. The top-seven teams from the Great Lakes Region remained in place after all but two had the week off. Michigan and Notre Dame were dormant, but Indiana, who is still in third, placed second at the Coast-to-Coast Battle in Beantown last weekend. Wisconsin and Ohio State rounded out the top-five. Dayton moved up to eighth as the only team that gained ground in the region on the week. Much like the Great Lakes Region, the Mid-Atlantic Region’s top-seven stayed put from a week ago. Georgetown, who is in third, was the only team that saw action out of that group, coming in at third at the Coast-to-Coast Battle in Beantown. Penn State and Villanova were ahead of the Hoyas at first and second, respectively, while West Virginia and Pittsburgh placed fourth and fifth, respectively. Bucknell jumped to eighth in the rankings after racing at the Panorama Farms Invitational. The Midwest Region saw the biggest shift in the rankings on the week, as there’s a different team atop the heap for the third-consecutive week. Iowa State placed second at the Roy Griak Invitational on the heels of top-10 performances from Cailie Logue (21:39 – fifth) and Anne Frisbie (21:43 – sixth). The Cyclones knocked Minnesota down to second after the Golden Gophers placed third at the same meet. Oklahoma State, Missouri and Kansas completed the top-five. All three squads were inactive last weekend. The only team that improved in the top-10 of the Mountain Region was Nevada, who moved to ninth despite not competing on the weekend. Colorado, New Mexico, Utah State, BYU and Utah – all of whom were dormant – made up the top-five for the second-straight week. A pair of Ivy League schools made a splash in the Northeast Region, as Columbia and Dartmouth made moves after the dust settled on the week. The Lions moved up one spot to third, while the Big Green leapt five spots to fourth after coming in fourth at the Coast-to-Coast Battle in Beantown. Providence, winners of the aforementioned meet, and Yale remained in the top-two spots of the region, while Cornell came in fifth once again. Other than Southern Miss, who moved up one spot to eighth, the South Region went relatively unscathed on the week. A trio of SEC teams in Mississippi, Vanderbilt and Mississippi State owned the top-three spots, respectively, once again despite having the week off. Florida State was the only team in the top-five that saw action this week, competing t the Mountain Dew Invitational to remain in fourth place in the south. Alabama came in at fifth after dropping to that spot a week ago. Texas A&M continued to climb in the rankings, moving up a spot to fifth after winning the Texas A&M Invitational. The Aggies were led by Ashley Driscoll (20:42.0 – third) and Kelsie Warren (20:54.7 – fourth). Arkansas, Baylor, SMU and Texas held down the top-four spots on the week again. Virginia made a charge into the top-10 this week, after jumping six spots to fourth. The Cavaliers won the Panorama Farms Invitational, with Frances Schmiede (17:10.4 – second), Beth Hawling (17:14.2 – third) and Emma Call (17:46.0 – eighth) all finishing within the top-10. The Cavaliers jump caused one-spot falls for each of the six teams behind them in the rankings. N.C. State, Furman and Louisville did not race this past weekend, but maintained the top-three spots in the region. Eastern Kentucky rounded out the top-five in fifth. Of the nine regions in women’s Division I cross country, the West Region was the only one on the week that saw absolutely no movement. Only three teams in San Francisco (third), Arizona State (ninth) and UCLA (10th) competed this past week. Oregon and Stanford held the top-two spots for the fourth-straight week, while Washington and Boise State came in at fourth and fifth, respectively.